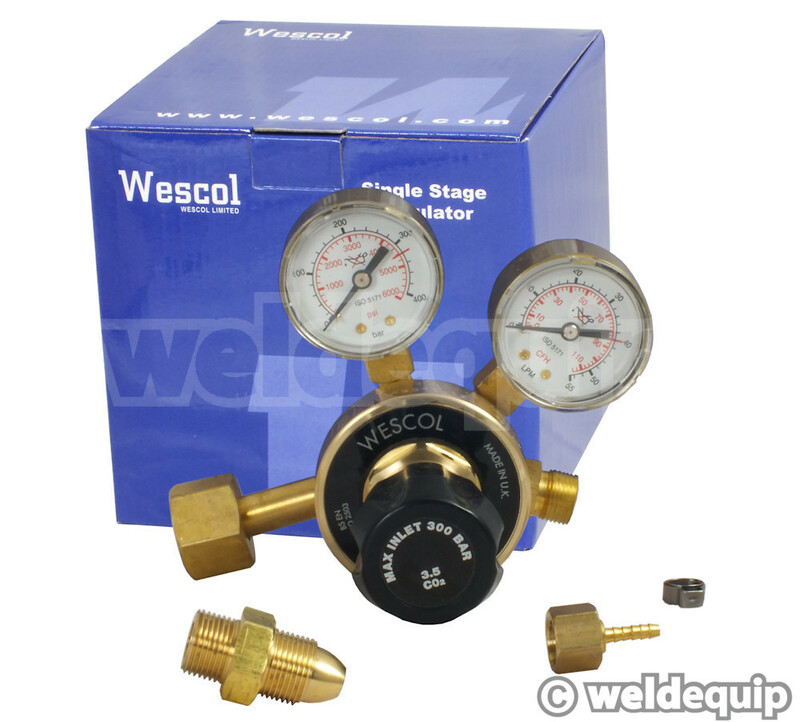 Includes dual purpose industrial gas regulator for use with both CO2 & Argon/CO2 refillable gas cylinders + correct gas hose fittings. A cracking little home workshop/small garage machine with a class leading specification. 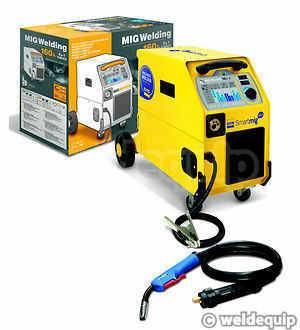 Ideal for more frequent use, such as a car restoration, using refillable type gas cylinders or gas-less, flux-cored wires. Euro-Torch connection as standard, so no messing + expense converting 'hard wired' torches - trickier to service & expensive to replace. 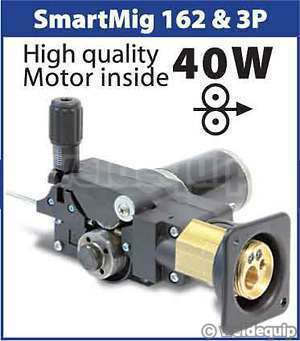 More powerful wire feed motor and dead easy set-up with it's 'Smart Control' panel. True 160 Amps maximum output. Traditional Transformer based design for dependable long term reliability and simple servicing/repair compared to cheap electronic Inverter based systems. One of the main features with this machine is it's 'Smart' control panel, which makes it an absolute doddle to set up & takes out all the guess work associated with setting Volts & Wire Speed correctly to achieve the best welds. Simply select the material thickness, material type, wire diameter in use, and adjust the wire speed in the relevant colour coded section to get factory pre-set optimized settings. You can manually fine tune if necessary for different joint types/preferences. Replacement control boards are readily available outside warranty, and are no more expensive to purchase than standard controls used on the likes of Clarke etc. A sound, reliable wire feed is fitted which uses a more powerfull 40 watt motor in comparison to most other machines of the same class. A professional style Euro-Torch is also fitted for rapid servicing & economical replacement/extension; accepts industry standard front-end parts. The machine will accept 5Kg medium size wire spools aswell as the smallest 0.7Kg spools, which can be handy for the one-off, small jobs of Aluminium/Stainless Steel. The factory supplied standard kit is for Gas-Less operation, which is fine on thicker materials + saves on having to source gas. To get the very best results though you need to be using gas. 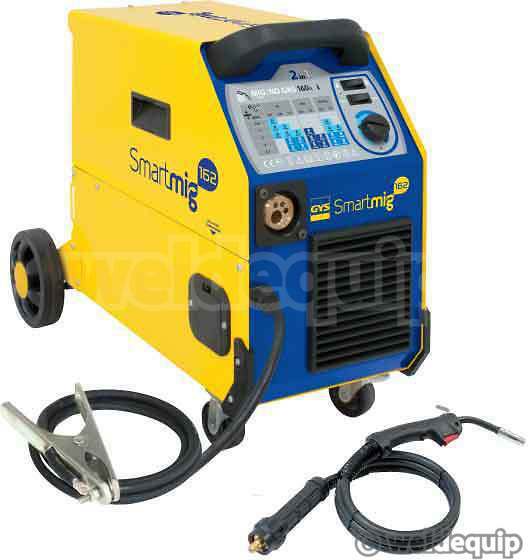 As the disposable type gas canisters supplied with smaller models are a complete waste of time & money!, the Smartmig 162 is designed to accept a proper, refillable type gas cylinder on the rear. It accommodates the now very popular rent free '10L' size of refillable gas cylinders perfectly, with securing straps on the rear cylinder carrier (a bit too long if there is any criticism to be made!). 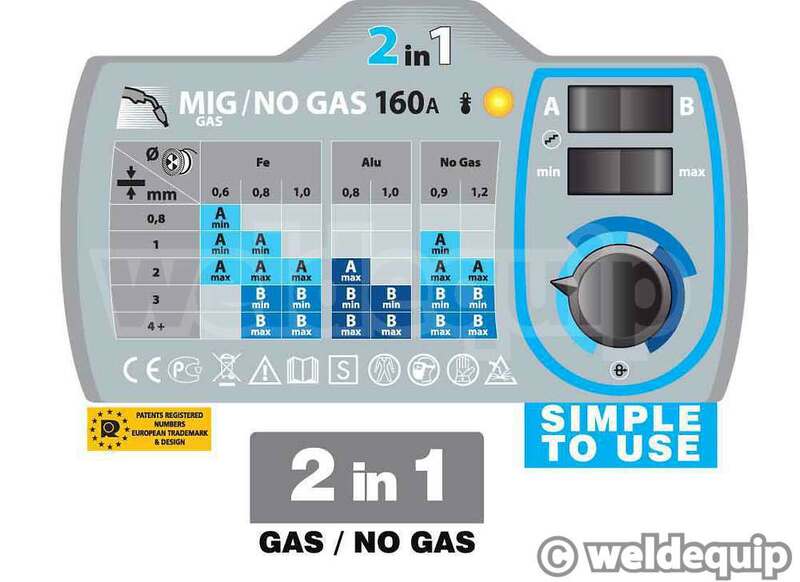 This machine worked better than some others on CO2 gas (above 0.9mm thickness) when we tested it, so we have included a dual purpose gas regulator with the Gas Upgrade Kit which can be used with both straight CO2 and Argon/CO2 mix gas cylinders, without having to buy different gas regulators. It’s an industrial quality, British Made twin gauge regulator, for optimum performance & safety, and is far superior to the usual types supplied with this class of machine. The correct gas hose connections are also included with this optional kit. All in all, an excellent little machine. A point worth mentioning, 'little' is what it is; designed to be just big enough to accept a 10L size refillable gas cylinder on the rear, without taking up more room than it needs to do in the workshop. A lot of machines are 'all case' with not much inside - designed to look like you are getting more for your money than you actually are! Wire Spool Sizes: 0.7kg - 5kg.